Bob Thomas was born in 1931 in Clerkenwell, London, within the sound of Bow Bells. He had three brothers and two sisters. The Thomas’s were a highly talented musical family, so it wasn’t long before Bob became proficient both on piano and piano accordion. Encouraged by his father, Charles, who played the concertina when not on duty as a London bus driver, Bob was soon emulating his three older brothers, Ron, Arthur and Charles on keyboard before honing his musical skills on bugle and drums in local The Boys Brigade band. During the Christmas break I was privileged to interview Bob about his lifelong love of jazz but I hadn’t anticipated the depths we would delve. Peter Butler: Bob, would you say your father and brothers had a love for jazz? Bob Thomas: Definitely. Each of them had their own accordions. The house was full of them along with a piano! Later I became a piano tuner and remain so for friends to this day. We also had a gramophone and a large collection of jazz records which I was forbidden to touch. But when I was home alone I simply couldn’t resist them. It was my brother Ron who really got me involved in jazz. I enjoy all types of music but from those early days jazz topped the bill. BT: I was principle drummer with the Boys Brigade Band but I played bugle with them too. Then I joined the Mission Band with the local church and they performed their own rendition of “While we were marching through Georgia”. That’s when I got hooked on trumpet. Later Acker Bilk made that number into one of his hit records. PB: So you have wonderful memories of those early days? BT: Indeed I do! And especially of taking the pledge! BT: Yes! Whilst with the Mission Band I pledged never to touch a drop of the hard stuff! And then I became a jazz musician! Imagine that! But then, I was only thirteen at the time. BT: I got my call up papers in 1949 and joined the Army. After a spell at Aldershot I was stationed at Folkestone in Kent. PB: Did jazz take a back seat during your army years? BT: Far from it. I met up with a new soul mate – Titch Large, a trumpet player from Liverpool, also stationed in Folkestone. We hit all the local jazz spots together and especially Sunday Jazz at the Leas Cliff Hall where the Jan Ralfini Big Band starred. Titch Large played with The Blue Magnolia Jazz Band in Liverpool. PB: And that’s when you took up the trumpet in earnest? BT: Yes, thereabouts. Jerry Salisbury, Acker Bilk’s bass player, sold me my first trumpet. To tell the truth, it was a bit the worse for wear as, in a rush, he had bashed it on a London bus stop! In the late 1950s I played along with my brother Ron at The Black Cat in Mornington Crescent. After that Pat Halcox, Chris Barber’s trumpeter, gave me private tuition. That was a huge privilege. He even sold me a trumpet and not just any old trumpet. It was a Doc Severinson Getson trumpet! But tragically it was stolen. I foolishly left it in my car outside the now demolished Wagon & Horses pub on the old A1 just outside London Colney in Hertfordshire. But I still have the mouthpiece! PB: So you have brushed shoulders with the greats? BT: Career wise, jazz has been a sideline, but a hugely important sideline in my life. After leaving the army I went into the motor trade and was fortunate enough to have my own garages in Mornington Crescent, Camden Town and then in Potters Bar. All of these locations were hotbeds of jazz. Stars such as Terry and Paddy Lightfoot and Acker Bilk were neighbours of mine in Potters Bar, as were Tucker Finlayson and John Richardson, Acker’s bass player and drummer. So I became their “garage man” and hence formed strong associations. PB: As an aside how would you rate, for instance, Terry Lightfoot and Acker Bilk alongside Ken Colyer? Above and above left: Promotional flyer designed and produced by Jazz&Jazz for Bob Thomas & The Thomcats. BT: All jazz greats, but perhaps Ken Colyer was more a jazz purist. Then again, Terry and Acker are just as much purists in their own right and have probably done and still are doing more to keep jazz alive. PB: Which bands did you play with? BT: I joined The New Eureka Jazz Band in Walthamstow when I lived in Potters Bar and played trumpet alongside Tony Weston on reeds, Pete McCullough on trombone, Dave Ufland, drums, and Mike Farrell on bass and banjo. I also have wonderful memories of playing with The Salisbury Stompers in Barnet for seven years when in was led by Bernie Tyrrell of wry humour and Jazz Guide fame. Bernie on drums, Pete McCullough on trombone, Jimmy Hurd on reeds, John Softly on banjo, Nobby Clark on bass and Shirley Longhurst, vocals. I recall one gig when during the interval I mistakenly used the ladies’ loo and got trapped in the cubicle by a couple of ladies directly outside chatting about lingerie. I heard the band strike up and dashed out with a curt “excuse me”. “Where’ve you been?” hissed Pete McCullough. I told him and he promptly seized the mike and announced to the fans “Bob’s been dallying with two damsels in the ladies’ loo!” Or words to that effect! Happy days! In the early 1960s I formed the Crescent City Jazz Band in Potters Bar with Martin Cole on banjo, Dave Maber on bass, Julian Greatrex on reeds and Dave Ufland on drums. PB: But a lot of those old jazz venues and pubs have gone now, including The Salisbury in Barnet, The Red Lion in Hatfield and The Cherrytree in Welwyn Garden City. A few years ago you decided to do something about this decline. BT: Yes, in 2000 I formed Bob Thomas and The Thomcats along with Richard Sharp who played bass. Richard later moved to Dover in Kent. The Thomcats played at regular venues including O’Neil’s Irish Club in Luton, Brocket Hall in Hertfordshire and Brocket Hall Golf Club when Lord McLaurin (formerly Chairman of Tescos and of The England and Wales Cricket Board) was president. The band also played weekly gigs at The Long and The Short Arm pub in Lemsford Village just outside Welwyn Garden City but sadly, as with so many other pubs, they no longer stage jazz. 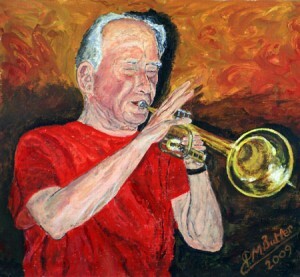 You painted my portrait on trumpet at The Long and Short in an endeavour to help keep jazz going in the pub. PB: But the Thomcats are still performing? 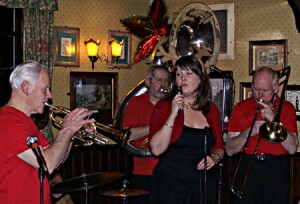 BT: Yes indeed, and we have a number of gigs lined up for 2012 including The Hertfordshire County Show at Redbourn in June, Jazz on The Island for Hertfordshire Action on Disability in Lemsford Village also in June, and a Sunday Lunchtime Jazz function on at Peterborough Conservative Club. Last year we played at The Hatfield House Craft Fair, The Shuttleworth Collection in Old Warden, Biggleswade, and at The Knebworth Festival and in all likelihood will do so again this year. We’ve also been booked for a wedding in September but although we do jazz parades at funerals, we’d prefer them to be very few and far between. 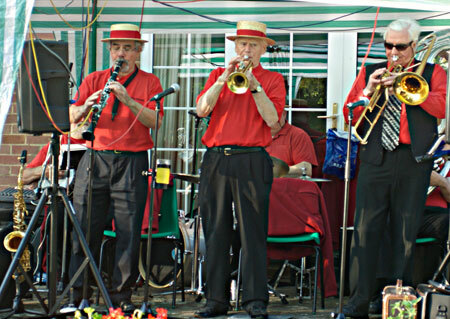 And who knows, perhaps we’ll be booked for a gig at the latest Welwyn Garden City venue, The Peartree Monday Jazz Club. Or even, dare I say, at a jazz revival at The Long and Short. BT: Great days, not to be missed. I played trumpet on the Bray boats, the Windsor boats and Maidenhead Steam Navigation Company boats, mostly with Len’s Seattle Six alongside Len himself on banjo, Clive Barton on trombone, Dave Maber on bass, Dave Ufland on drums and Tony Cam on reeds. Tony was the nephew of Sydney Cam who designed the Hurricane fighter plane. 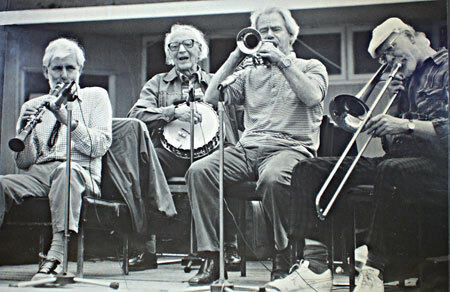 Tony Cam on clarinet, Len Chambers, leader of Len's Seattle Six, on banjo, Bob Thomas on trumpet and Pete McCullough on trombone at a Barnet Jazz Festival. Len Chambers was a great friend and passed on to me his huge catalogued collection of jazz records which I now have securely stashed away. 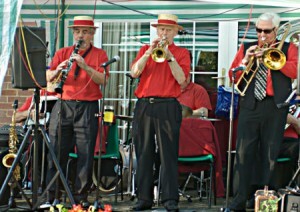 The photo is of me on trumpet along with Tony Cam on clarinet, Len on banjo and Pete McCullough on trombone, It was taken at a Barnet Jazz Festival. On another occasion at The Christopher in Eaton during the Windsor Festival, Lonnie Donegan’s daugther took the mike from me and performed a wonderful rendition of ‘Tin Roof Blues’. But the most dramatic show was with Sam Weller’s band on the Maidenhead Steam Navigation boat, The Belle, when the entire canopy collapsed on the musicians. But the band played on. That’s jazz! Jazz&Jazz Presents Kim Cypher – Saxophonist, Vocalist and Composer!